Our pet services will provide many touching and affordable ways to help you pay tribute to the joy your pet brought into your life. We offer cremation services, memorial options, grief counseling and more. If you have experienced the loss of a pet, call today 636-875-5700. Grief after the loss of a pet is a natural response and can affect the entire family in different ways. To help you cope, Baue Pet Services offers complimentary grief resources and counseling for owners and their families who are in need. We hold a complimentary Pet Loss Support Group on the first Monday of every month for those needing guidance in their grief. This group meets at Baue Pet Services (3950 West Clay Street, Suite 100, St. Charles, MO 63301 from 7pm-8pm. The group is open to anyone who is in need of support after the loss of their pet companion and is led by one of our Pet Specialists. 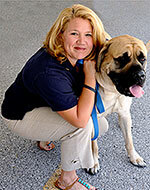 Our Grief Services Director, Kelly Karavousanos, LPC, CT (pictured here, with her companion Zeus) is able to provide individual counseling should you want further support beyond a group setting. Kelly has completed the Pet Loss Companioning Certification Program at the Center for Loss and Life Transitions with Dr. Alan Wolfelt and Coleen Ellis. In addition to Grief Services, our Lending Library has books and literature specific to pet loss and pet loss support. This library is available as a free resource to our community. Kelly and our Pet Specialists have a special understanding of the emotions involved when dealing with the death of a pet. Such losses can be especially difficult for children, as they are often a child’s first experience with death and loss. For more information on grief support, or to sign up for our class, please contact Kelly at kellyk@baue.com, or call her at 636-875-5700. Our pets love us unconditionally. They are truly a part of our families and we experience a tremendous – and sometimes unexpected – sense of loss when they leave us. We provide services for pets and those coping with the loss of a pet…Because Pets are Family Too.